The dirt road twisted upward, climbing the side of a mountain. I dodged boulders and powered my way out of ruts that threatened to swallow my bike’s knobby tires. At the top of the hill, the road disintegrated into a livestock trail, then disappeared altogether. With one eye scanning the grass for snakes, I carefully turned the motorcycle around. Brian pulled a topographic map from his backpack. 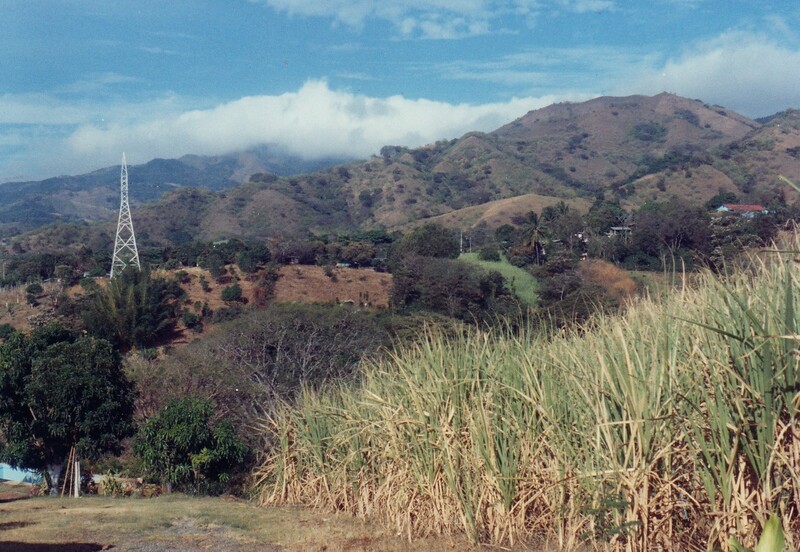 Sweat poured off of us in the tropical sun as we searched the surrounding valleys and sugarcane fields for a landmark. Nothing looked familiar. Our first day touring Costa Rica, and already we were hopelessly lost. From a gated driveway to our left, a beat-up Toyota truck appeared, three young Tico men crammed into the cab. They stared at the pale North Americans fiddling with a compass. Eventually, one of them emerged from the truck and asked us, in Spanish, if we needed help. “¿Habla Inglés?” Brian asked hopefully. The Tico shook his head and said something in Spanish. We showed him the map, and asked – for the first of many times – “¿Donde esta aqui?” Where is here? The young man pointed and gestured. His two friends joined into the action, arguing among themselves about the best route to Grecia. “No comprende,” we said. Finally they pointed to the truck and the motorcycles, getting across to us the idea that we should follow them. They all watched with great interest and humor while I kick-started my motorcycle. We followed them down the mountain and along a back road which crossed a river, ran underneath the Pan-American Highway, and emerged at pavement. The Tico driver pointed north. “Diez kilometres a Grecia,” he said, “y derecho a la iglesia.” With an easy smile, he pulled a U-turn and went back the way he had come. Grateful for the assistance, we accelerated on the paved road toward Grecia. It took only a few minutes before we lost our way again. Getting lost in the jungles of Central America was the only one of my fears about touring Costa Rica by motorcycle that actually came true. Robbery, deadly snakes, colliding with a crazy driver or chicken, crocodiles lurking at river crossings, and the lack of bathrooms along the route: these fears never materialized. Exploring Costa Rica by motorcycle proved to be an extremely challenging journey of lost and found. It began when I spotted an ad at the back of a motorcycle magazine for a company called Motorcycles Costa Rica. I called the number, in Virginia, and talked to Jim Thompson, a man whose calm, soothing voice assured me that my scant two years of riding experience in Alaska was adequate to tackle Costa Rica. Three weeks later, we stumbled off the red-eye flight in San Jose, Costa Rica and were whisked to a bed-and-breakfast called Villa Tranquilidad in Atenas. Coming from a sub-zero January in Alaska, I immediately realized that I was overdressed. Quickly I changed into shorts and went to sit on a terrace next to the pool. Unseen insects buzzed in the trees; brightly colored birds flew beneath the tropical sun. I relaxed that afternoon, trying not to think about the winding, traffic-choked road we had traversed between the airport and Atenas. The next morning Jim fitted us with Honda motorcycles. Brian took one of the XR250L’s, while I chose the XR200, mainly because it was the only one small enough to fit my 5’ 5” frame. Jim gave us some maps and suggested a couple options for loop trips, then we were on our own. 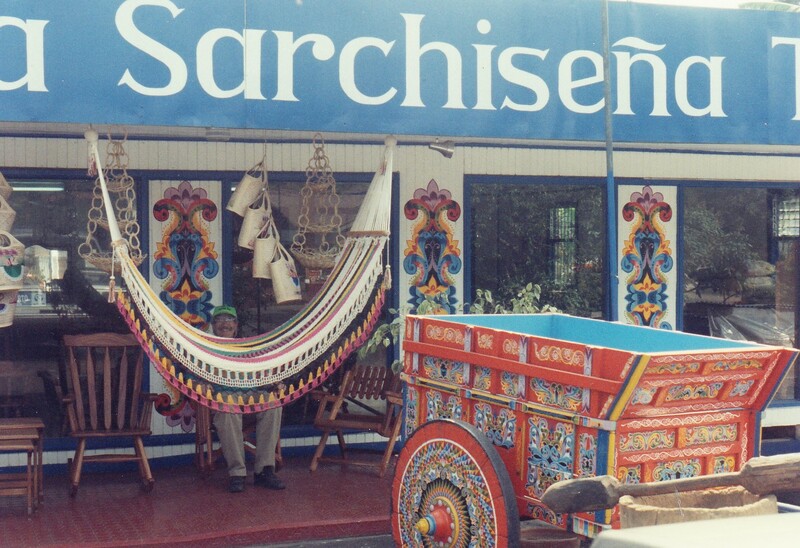 Eventually, after the young men in the Toyota set us back on track the first day, we found our way to Sarchi, a town known for its beautiful wood and leather crafts. We continued on some distance past Sarchi, until growling stomachs led us off the paved road to a restaurant called Señor Pollo, Mr. Chicken. The waitress babbled in Spanish; we nodded weakly and waited to see what she would bring. The result was a delicious lunch consisting of half a roasted chicken (one that was, no doubt, crossing the road yesterday) and a fresh strawberry milkshake. The next day, Sunday, was, Jim advised, a good day to stay off the paved roads. Costa Ricans, or Ticos, as they called themselves, worked six days a week. Sundays they were off, and half the population of San Jose drove to the coast. At his suggestion, we skipped the highway and instead followed a rough route over a mountain south of Atenas. Views of coffee plantations and cattle rangeland unfolded around every turn. In what seemed like the middle of nowhere, we rode around a corner and suddenly found pavement beneath our wheels. The pavement lasted for a couple hundred meters, then ended abruptly at a driveway leading into a beautiful whitewashed house. Flowers filled the yard; the tile roof shimmered in the heat. Beyond the driveway, the dirt road returned. 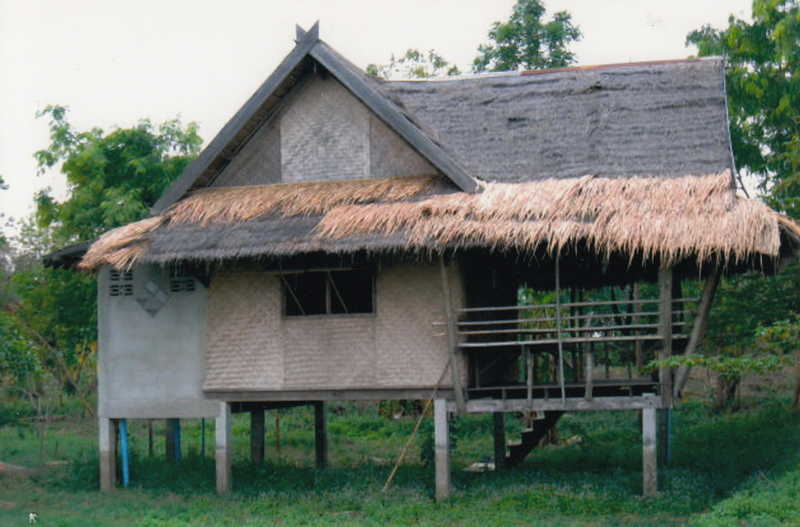 It was a reminder that, though the rural countryside appeared desolate, a lot of people lived tucked away in the hills. Creatures on the road also reminded us of civilization hidden behind the wild veneer of the mountains. 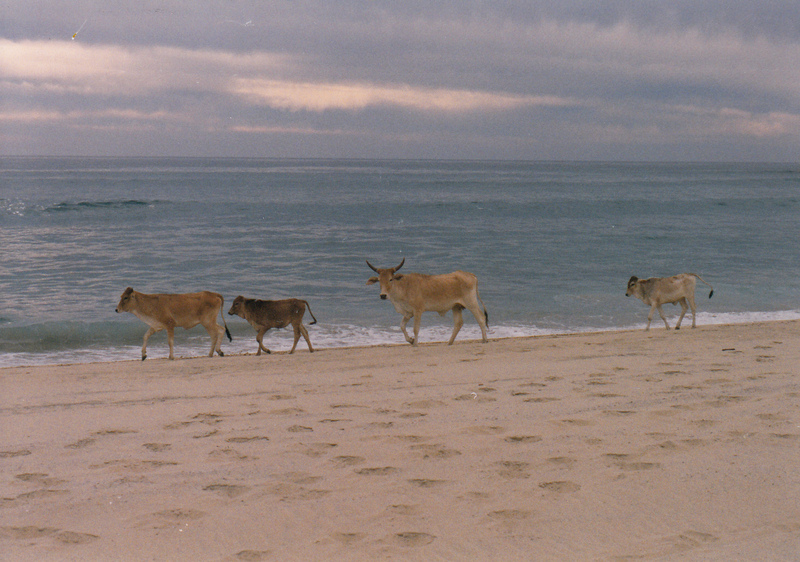 Cattle ranged freely, often wandering onto the road. Chickens waddled right into our paths. Small dogs, cats, and pigs came into view. Children ran along the road, playing; mothers walked sedately behind them, umbrellas shielding them from the tropical sun. 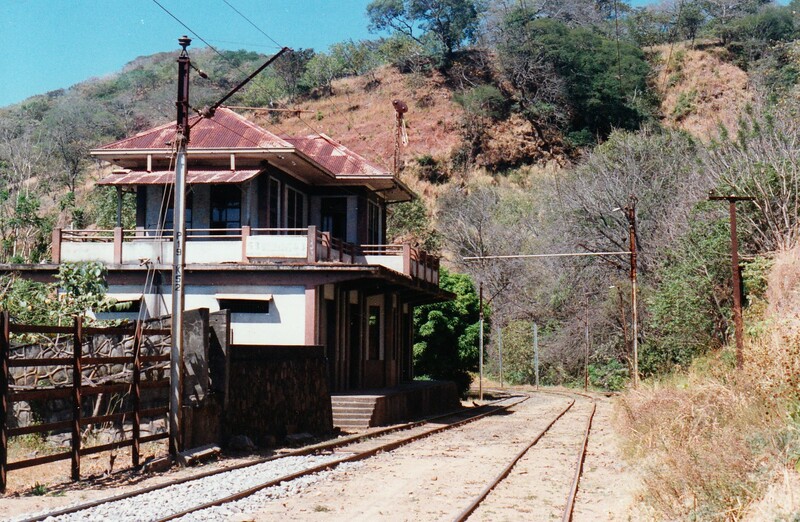 The road followed some train tracks for several kilometers before plunging down another steep hill to the Rio Tarcoles. There a wooden bridge, one lane wide and none too sturdy, spanned the river directly above a radical stretch of whitewater. As I eased my Honda onto the bridge, I looked up to see a date etched on the span: 1928. Rising from the river canyon, the road led to San Pablo, a sleepy town arranged around a grassy plaza. I felt all the Tico eyes upon me as I dismounted and removed my helmet. I could almost hear the collective gasp: That’s a woman!! 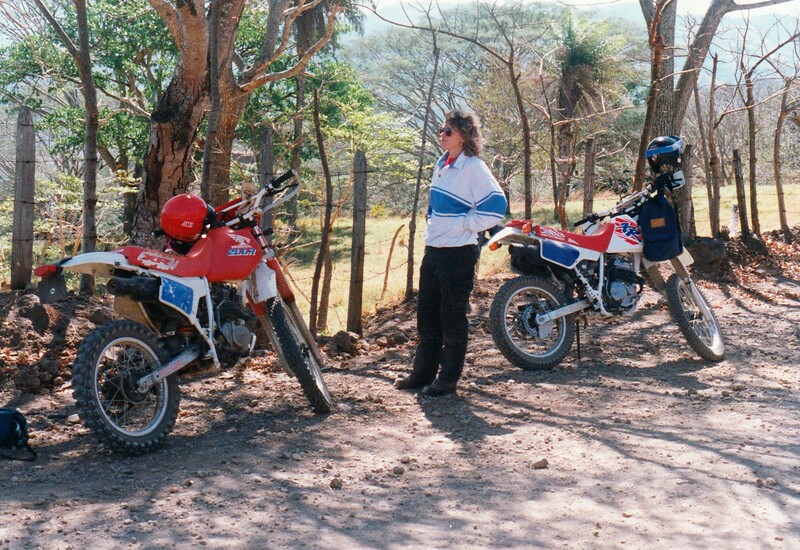 In my travels through Costa Rica, I only once saw another woman on a motorcycle. Wearing a skirt, she sat behind her man – side-saddle!! Apparently the people of this conservative nation viewed motorcycling as a man’s sport. Intent on doing my part to raise feminist consciousness, I pasted a smile on my dust-covered face. Perhaps someday, I thought, some Tica girl might tell her father that she, too, wanted to ride a motorcycle. After a lunch of tortillas, cookies, and Coca-Cola, we climbed a paved road out of San Pablo to a ridge top. From the summit, we rode along the spine of a mountain which divided the river valley to the left from the coastal plain to the right. For thirty kilometers, we leaned into peg- scraper curves. Across a valley dotted with villages, a distant volcano flanked by cloud forest was visible. It was difficult to keep my eyes on the road. Eventually we glided into a good-sized town. I spotted a sign pointing the way to San Jose, only 43 kilometers away. “Yikes!” I exclaimed, motioning for Brian to pull over. We stopped in front of a church and retrieved the maps to figure out where we were. The name of the town did not match anything on the map. “We’ve ridden off the map!” I said. Donde esta aqui? Lost, once again, in Costa Rica. “We could ask directions in the store there,” Brian suggested. “But they’ll answer us in Spanish,” I countered. The people of Costa Rica, when told we didn’t understand Spanish, responded by talking faster, waving their arms, and shouting. Unprepared to deal with this routine again, I suggested that we turn around and go back the way we came. Brian assented, mostly, I suspect, because he wanted another go at the curvy road between the mystery city and San Pablo. We headed back over the wooden bridge and, after a stop for a Coca-Cola in a tiny village near the tracks, made it back to the bed-and-breakfast just before sundown. Jim accompanied us the following day on our trip to the beach. He said he needed to complete a business transaction, although I got the feeling that his errand was just an excuse to go riding. Out of Atenas, the main highway toward the coast followed an ancient route used during the Spanish colonial days. Like every other road in Costa Rica, it skirted cliffs and sported potholes. Huge sugarcane trucks and busses barreled around hairpin curves on the way down the mountain. One-lane bridges appeared without warning. A truck with its hood up sat right in the middle of the road. Its owner grinned at me as I roared past, then went back to the leisurely task of adding a liter of oil to his engine. At Orotina the air temperature and the humidity both climbed by 20 points. The size and frequency of potholes increased steadily. Just after we crossed the Rio Tarcoles, I felt my bike wobble. A mile later, Brian motioned me into a roadside restaurant parking lot and told me the bad news: my back tire was flat. 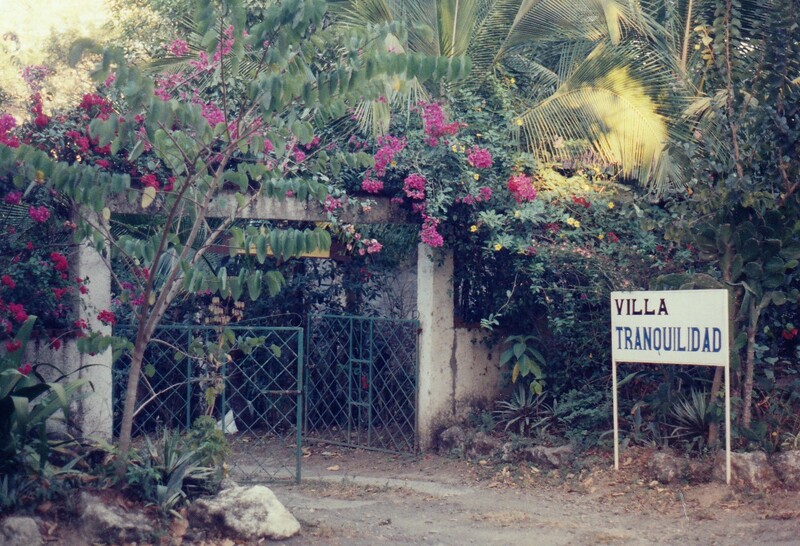 Once in Jaco Beach, we cruised the main drag, stopping while a three-foot-long iguana crossed the road. No one hawked souvenirs on the sidewalk; no one tried to steal my bag. Though Jaco was said to be the most popular beach in the country, it seemed low key and tame compared to Puerto Vallarta or Mazatlán. We went into the mountains above Jaco Beach the next morning. Within the first 20 kilometers of the ride, we made four river crossings. Veteran off-road riders would probably not term them rivers, but for me, inexperienced in crossing anything bigger than a garden hose, the streams looked swift and terrifying. I put the bike into first gear, took a deep breath, and plunged in. With white knuckles I hung on as the tough little Honda forged its way across the gravel riverbed safely. Brian’s luck was not so good. Starting in second gear instead of first, he lost momentum in the swift current and his motor stalled. Plunk! Down went his booted feet into the river. But the water was warm, and he quickly got the bike restarted. Roads in the mountains inexplicably branched off, seeming to go every which way. We had to stop three times in a five-mile stretch to consult the map. A truck going the other way stopped. Hanging his head out the window, the driver inquired in Spanish something to the effect of, “Do you have any idea where you are?” Brian waved the map at him and smiled. “Turista,” he explained. The man nodded and disappeared in a cloud of dust. Vast coffee plantations lined the road. Leather-skinned men working in the fields waved as we went by. Children in the tiny villages peeked at us shyly; I wondered if they had ever seen North Americans before. Certainly they had never seen a blonde, sunburned Alaskan woman on a motorcycle. Passing over another mountain range, we were treated to a spectacular view of the Pacific Ocean and, in the distance, the Nicoya Peninsula. I stopped to take a picture, and instantly regretted it as I realized the difficulty of kick-starting a motorcycle facing downhill next to a suicide cliff. 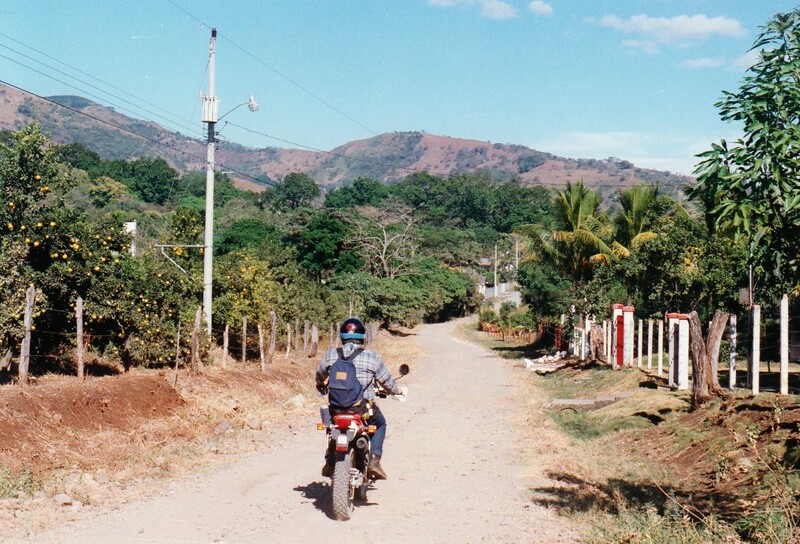 But Costa Rica had improved my riding skills; wiping the sweat from my forehead, I squeezed the front brake, pulled in the clutch, and hit the kick start. The engine roared to life, and down the hill I went, brakes squealing. On the last day of the motorcycle adventure, we followed the paved road back to Atenas, stopping at the Carara Biological Reserve to watch some crocodiles recline lazily on a river bank. Then it was up the hill, dodging potholes and runaway cows and crazy drivers all the way back to Villa Tranquilidad. Five days, 600 miles of riding, and I had only seen a small portion of Costa Rica. Remaining were more than a dozen national parks, volcanoes, jungle rivers, rain forests, and pristine beaches. So many more roads to get lost on! So many grinning Ticos to ask directions from! 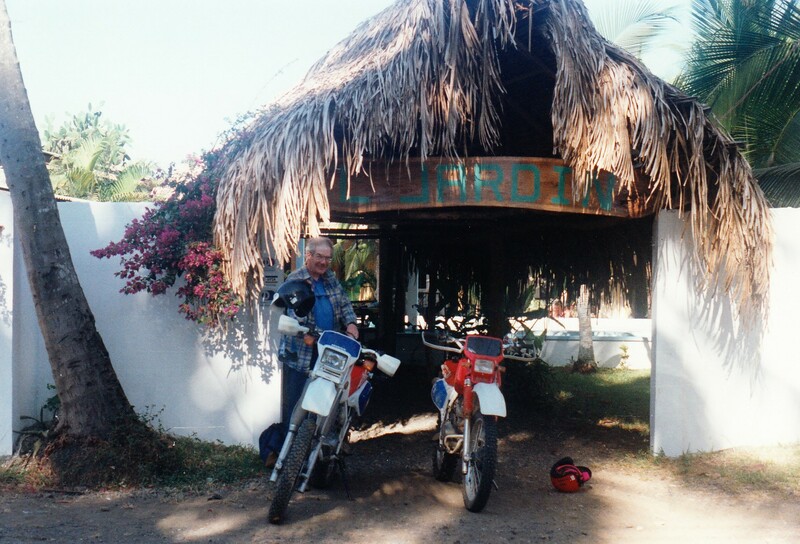 As Jim rolled the Honda into the garage, he casually mentioned that his company was running a trip down the Pan-American Highway from Costa Rica to Patagonia next year. As children we heard many of Grandma Louise’s stories about Colorado. She was born in a log cabin a few miles outside of Creede, to a mother who had been born in Leadville and spent part of her childhood in Cripple Creek. This family history at high altitudes caught my imagination when, a couple years ago, I started looking for these places on a map. I couldn’t help but notice the winding two-lane roads and high passes on a route that traversed through those towns. Out rolled my motorcycle on a sunny day in August, and off I rode to search for my roots in the mountains of Colorado. My first destination involved popping over Wolf Creek Pass from Durango. Once on the east side of the Continental Divide, I turned north along the headwaters of the Rio Grande. The valley I followed was wild, isolated, and beautiful. I tried to imagine what it might have felt like to be a child living so far from civilization. Several miles past Wagon Wheel Gap, I turned onto a scarcely marked dirt road which led to La Garita Ranch. The ranch was purchased in 1908 by Senator Lawrence Phipps as a fishing and hunting retreat for himself and his buddies. My great-grandfather, Otto Crain, worked as the first ranch foreman. He arrived with his new bride, Gertrude Kavanagh, right after their New Years wedding, 1909. In a one-room log cabin that October, Gertrude gave birth to their first child, Louise. Continuing my ride upstream along the Rio Grande River and the old railroad bed for a few miles, I reached Creede, a mining town which boomed in the 1890s. This would have been the closest town for the young Crain family to buy supplies, get medical help, or meet their neighbors. It took me 15 minutes to ride there, but might have taken them half a day. A Polish hot dog purchased at the Best Little Doghouse In Creede satisfied my hunger while only setting me back $3.75. Heading north out of town, Highway 149 carried me past the Rio Grande Reservoir and over two high passes. A flash of blue caught my eye at the top of Slumgullion Pass as a mountain bluebird flapped past, thriving like the evergreen trees at 11,000 feet. The Silver Thread, as this highway is known, looped down to Lake City, another isolated mountain town founded in the latter part of the nineteenth century to serve as the commercial center for nearby mining claims. Today it hangs on mostly due to a small but steady procession of two- and four-wheeled explorers traveling the rough dirt roads of the Alpine Loop Backcountry Byway from Silverton. 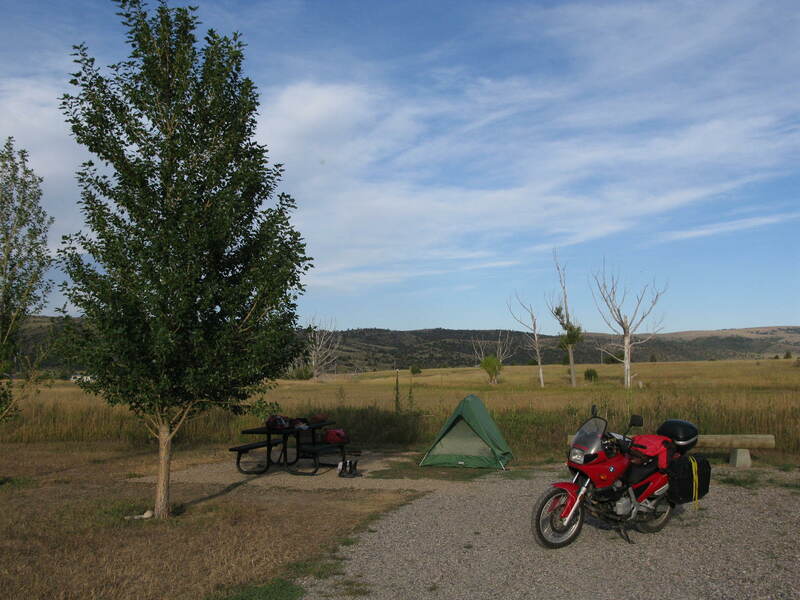 I crossed Highway 50, one of the main east-west thoroughfares in Colorado, rode beside Blue Mesa Reservoir for awhile, and found a place to camp at Crawford State Park. The next morning I rode to Paonia, longtime site of a well-known BMW rally. Paonia wasn’t high in the mountains as I had imagined. Rather it was a scattering of valley bottom farms watered by the Gunnison River, with roads running out like spokes to a number of spectacular high country loops. The perfect base camp for a motorcycle rally! I followed Highway 133 over the pass to Redstone, a town appearing a little too touristy for its own good. Emerging from the mountains, I stopped for a breakfast burrito in Carbondale. The red rocks made a nice backdrop for a down-to-earth sort of town. Turning uphill out of Carbondale, I spied a newly ignited brush fire running up a hill on some BLM lands. My pulse quickened reflexively, since I have worked for more than twenty years in the fire suppression field. But a helicopter had already been launched and it was working the flames with its bucket, so I didn’t need to stop. A few miles later I reached world famous Aspen. To my right, trees were clear-cut in rows down the mountainsides to accommodate ski lifts and world class runs. Nothing of interest to a motorcyclist in August!! The paved approach to Independence Pass narrowed with curves turning back on themselves. I leaned into the arcs and breathed deeply of the thin air. It was Never Summer on the top of the Rockies – 12,150 feet elevation, swept clean of trees and oxygen. On both sides, numerous Fourteeners – otherwise known as Bigass Mountains – towered over the pass. When I finally reached Leadville late in the day, I was dismayed to find that a “Boom Days” festival was underway, and every hotel was full. 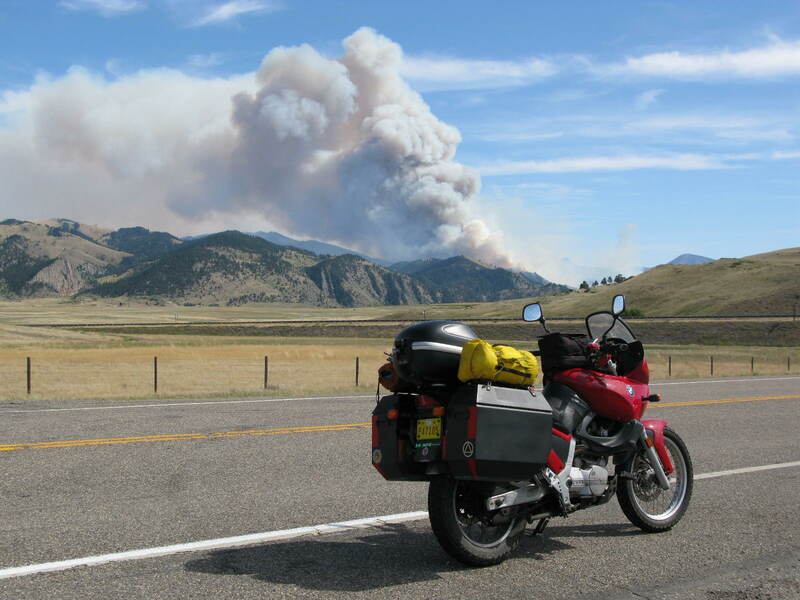 A bored hotel clerk took pity on a weary motorcyclist who had just ridden 500 miles across the rooftop of Colorado. With nothing else to do, she obligingly made some calls and found me the last available room in town, at a bed and breakfast a block back from Leadville’s main street. Refreshed and revitalized after changing into shorts and sandals, I walked downtown to look at the restored grandeur of Leadville. The town had been the second-largest in Colorado during the mining heyday of the 1880s, with a population estimated at 40,000 people. Here passed through famous folks like Horace Tabor, Doc Holliday, Harvey Mudd, and Poker Alice. Here too, settled thousands of not-so-famous miners and people servicing them, including my great-great-grandfather, Civil War veteran Austin Kavanagh. He, along with his wife Mary and several children, made the difficult trek across country by rail, stage, and foot to reach Leadville in 1882. Austin had some connections with politicians and businessmen from his native Boston, so he established himself as the right-hand-man of a wealthy local businessman in Leadville. Most of their children perished in the harsh conditions at 10,400 ft elevation, but then two more (including my great-grandmother Gertrude) were born in Leadville, growing up fit and hardy in the rough mountain town. I tried to imagine, as I admired the ornate architecture of the Delaware Hotel and the collected antiques in the Healy House, what it might have been like to grow up in a lawless mining town where, so the saying goes, summer only lasts for 30 days, and those days are never consecutive. I felt great (if a little winded) walking around two miles above sea level on one of those 30 summer days, enjoying fake shoot-outs in the street, and women parading in period costumes for Boom Days. Typical street food, gyros and lemonade, tasted extra-flavorful in the thin air at the top of the world. The next day I rode out of Leadville and down a side road to reach the Leadville National Fish Hatchery. As I walked the nature trail between the lakes above the hatchery, I pictured my grandmother Louise and her seven siblings wandering around in these woods while their dad raised trout. The Crain family moved here after several years in Creede and lived in a tiny cabin behind the main hatchery building. The hatchery was a peaceful, natural place where I imagined the children would grow up away from the influence of crooked miners and other shady characters back in town. They lived there in apparent bliss, a loving Irish-American family with a new baby arriving almost every year. As I rode down the mountain from Leadville and headed east to Cripple Creek, I thought about Gertrude’s hardy upbringing . For several years during Gertrude’s childhood, the Kavanaghs lived in the rough mining town of Cripple Creek, the scene of grim mining accidents, workers’ riots, and shootouts in the 1890s. What violence did she witness as a child there, and how did she stay out of harm’s way? The formerly difficult trip across wild mountain terrain between Buena Vista and Florissant was smoothed by some gently curving asphalt roads. A spur road to Cripple Creek rose steeply out of cattle and llama ranch lands into jagged black rock cliffs. Cripple Creek itself has long since ceased to be a mining town, unless you count mining for people’s hard-earned savings. The main street was lined with casinos, attracting people from Denver and Colorado Springs to try their luck on the poker machines and roulette wheels. One of my Ben Franklins disappeared at lightning speed into a one-armed bandit, so I gave up and headed back to my bike to continue my journey. An unexpected surprise and delight on the downhill side of Cripple Creek was a sweet little two-lane backcountry road, adorned with luscious undulations and sweeping curves. Lined with late summer sunflowers and scented of juniper, the road was posted with 25 mph speed signs but I confess to doing twice that, leaning into the rounds and sharing the road with only a handful of Sunday drivers, mostly motorcycles. In high summer, with mild temperatures and flowers abloom, it was tempting to stay longer in the Colorado Rockies. I’m sure Gertrude’s family felt that way too, until the fateful year in which their fortune changed. In the fall of 1919, a horse stepped on Otto Crain while he was working at the hatchery. Over the next couple weeks, the injury became infected. Lacking antibiotics, the doctor wasn’t able to halt it. Septic shock set in, and Otto died in November leaving Gertrude a widow with seven children to support. She managed to survive by farming out the kids and finding work as a waitress in a Harvey House. Five years later Gertrude re-gathered her family and bailed out of the mountains, riding a train to Pasadena, California to live with her sister. The Crains were unable to stay in Colorado. But the mountains stayed with them. 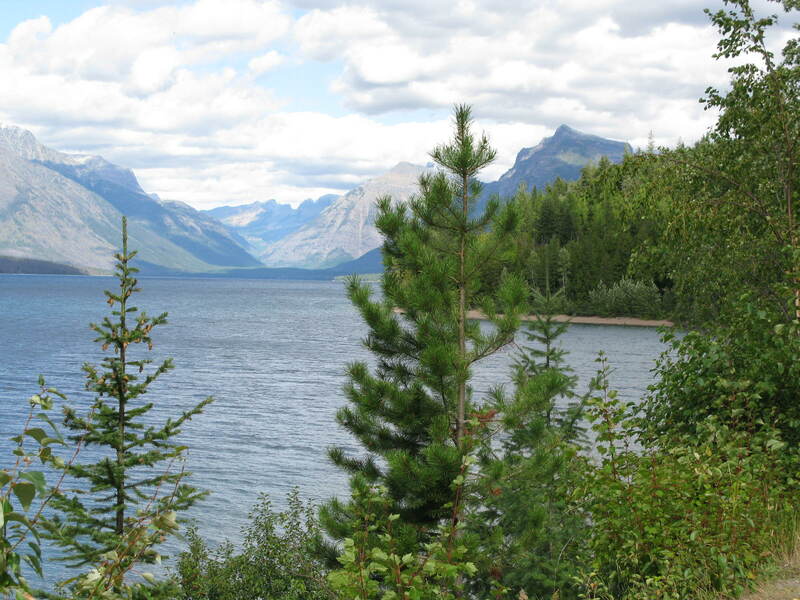 More than sixty years later, Grandma Louise reminisced fondly about blooming columbine and fireweed, tall spruce trees, ice-cold clear lakes, and aspen leaves shimmering like fire in the weak autumn sun. I saw Colorado as she described it, big and bright and beautiful. Long after my ride ended, the power of the mountains still reverberated. Someday soon I will return, to learn more about the pioneering spirit of my ancestors who carved a life for themselves in the wild highlands of the Colorado Rockies. We planned to attend a regional sidecar club rally in September. There was just one drawback: the rally took place in eastern Kansas. Kansas? What was there to see in Kansas? Though I had never set foot in the state, I had heard plenty about how flat and tedious the journey is across the Great Plains. And I had watched The Wizard of Oz enough times to cement my conception of Kansas, always appearing in black and white. A GPS unit could tell me which route would get us to the rally site in Council Bluffs the quickest. A good old fashioned map told me something more important: What was along the way. Between our home state of New Mexico and the rally, there existed the remnants of a trail over which was etched the history of American commerce. My husband and I picked up the Santa Fe Trail where it branched into two routes. From Interstate 25 in northeast New Mexico, we rode onto Highway 56, a.k.a. the Cimarron Cutoff, across some empty country. The Point of Rocks east of Springer marked the trail’s last (or first, depending on whether you were coming or going) view of the Rocky Mountains. Undulating plains along the Cimarron Cutoff lay dry and barren, crossed only by a couple of small creeks and inhabited by a healthy population of rattlesnakes. In one segment between Springer and the Oklahoma border, I braked hard four different times to avoid squashing three-footers stretched across my lane in the afternoon heat. The first night on the Santa Fe Trail, we camped at Cimarron National Grasslands, 11 miles northeast of Elkhart, Kansas. The campground sat next to the Cimarron River, one the few permanent water sources along the southern branch of the trail. Trail travelers traditionally stopped here to water their animals and rest before pushing on through the big empty. The next morning, I walked along remnants of the trail that was first traveled in 1822, under a sky the color of orange sherbet. 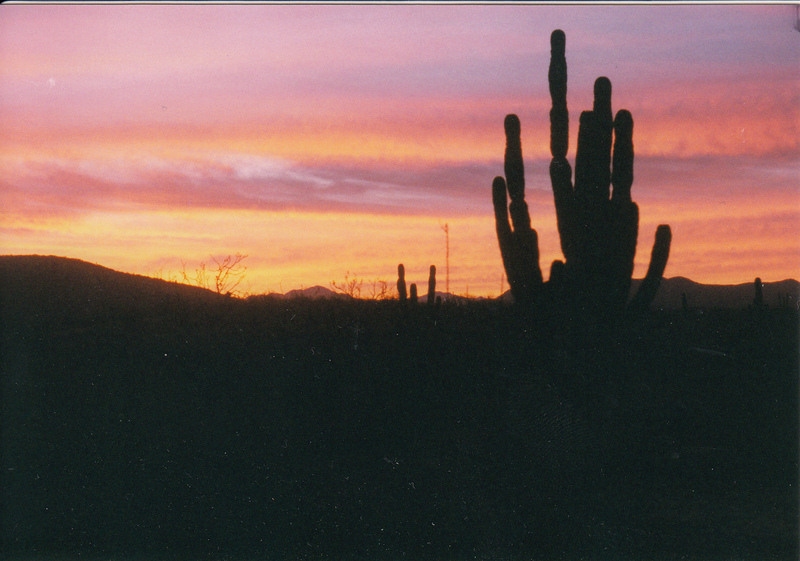 Sounds filled the dawn: coyotes yipping nearby, a flock of birds startling from a riverside bush. A cottonwood tree stood sentinel by the trail. In my imagination I became one of the intrepid traders who paused beneath this same tree nearly 200 years before. Unlike the Oregon Trail farther north, tramped by thousands of migrating settlers, the Santa Fe Trail was all about commerce. The city of Santa Fe in the early 1800s functioned as a northern outpost of the republic of Mexico. Merchants running the trail between Santa Fe and Kansas City traded silver, mules and Mexican textiles for American manufactured goods and supplies hauled via the Missouri River. Plains Indians along the way joined the free enterprise fray, trading buffalo robes and beaded clothing for horses. Some conflicts were inevitable, but trail users for the most part cooperated with each other because everyone had something the others wanted. Two hours northeast of Elkhart, the northern and southern branches of the Santa Fe Trail converged near Dodge City. Thanks to Hollywood, exaggerated stories about the Wild West had transformed Dodge City into a kitschy tourist attraction. We chose not to pay eight bucks to tour a re-created version of the Front Street which burned to the ground in the 1880s. But we did take a few minutes to admire an authentic steam engine sided next to the visitor center and poke around a couple of turn-of-the-century shops selling Western gear and memorabilia. After lunch, I finally got to say the words I’d waited all morning to utter: “Let’s get the hell out of Dodge!” Northeast we continued along the Santa Fe Trail toward civilization. The famous trail landmark, Pawnee Rock, was our next stop. The tallest natural feature for miles around, the rock marked the halfway point between the Missouri River and Santa Fe. Many early travelers carved their names into the rock face. Today, modern graffiti has mostly covered the original signatures. Looking south from the top of the rock, we could see a line of trees making the bank of the Arkansas River. Beyond, the seemingly endless prairie-turned-farmland plain swam before my eyes, flat as slate, extending forever. We overnighted 80 miles east of Pawnee Rock at a lake near the Maxwell Wildlife Refuge. Our ride on a dirt road back to the highway the following morning was halted for a few magical minutes while a herd of bison passed by. Separated from us only by a cattle guard, they milled around, males sparring half-heartedly, calves chasing after mothers who leisurely grazed on the remnants of long prairie grasses. The memorized words of Carl Sandburg’s poem, Buffalo Dusk, came to me unbidden: The buffaloes are gone / And those who saw the buffaloes are gone / Those who saw the buffaloes by thousands and how they pawed / the prairie sod into dust with their hoofs / their great heads down / pawing on in a great pageant of dusk…. A lump formed in my throat, a sadness for the passing of an era now extinct from the plains. In the Flint Hills, we rode south of the Santa Fe Trail a few miles to visit the Tallgrass Prairie National Preserve. From the parking lot, rolling hills overlooked what’s left of a tallgrass prairie that once covered 400,000 square miles of the Great Plains. We stretched our legs walking up a steep driveway to reach a ranch home and three-story barn built of hand-cut limestone in 1881. A curving scenic road led through the Flint Hills to Council Grove, where buildings 150 years old adorned the town’s main street. Historic Conn Store, dating from the 1850s, provided travelers a last chance for “retail therapy” before hitting the dusty trail west. Across the street, Hays House, built in 1857, served as a gathering place for meals, church services, court trials, mail distribution, and political rallies. Today it is billed as the oldest continuously operated restaurant west of the Mississippi River. We attended a “Santa Fe Days” celebration held on the grounds of Terwilliger Home, a limestone building on Main Street dating to 1861. Locals in period costumes spun wool, sang, and sold handmade crafts, evoking 19th century village life – at least until they emerged from the house carrying hamburgers and cans of pop. After the rally we detoured north, then picked up the Santa Fe Trail again in Dodge City and followed its northern branch back home. Though longer than the Cimarron Cutoff, the mountain route was preferred by trail travelers because it offered more water sources and less danger of Indian attacks. We liked the fact that it was, as the beer commercial says, a few degrees cooler. Wagon tracks were visible in several places along the route between Dodge City and the Colorado state line. The Santa Fe Trail followed the bank of the Arkansas River, once the southern border of the United States. The railroad, too, followed the trail route next to the river. Ironically, the materials used to build the railroad were hauled on the Santa Fe Trail; once completed in 1880, the railroad then rendered the trail obsolete. But later, when long-haul trucks eclipsed freight trains, the trail route was resurrected and paved. Just outside of Las Animas, Colorado, we camped another night on the old Santa Fe Trail at a place called Boggstown. Situated on the Purgatoire River not far from Bent’s Old Fort, the little settlement was founded by pioneer Thomas Boggs in 1862. A group of families related by marriage, including Kit and Josefa Carson, built hacienda-style houses in the settlement during the 1860s and 1870s. When the site was acquired by a local historical society in 1985, ruins of more than 20 structures were located. Slowly the homes of these early influential families are being restored. That night I felt a deep kinship to those who camped before me along the Santa Fe Trail. 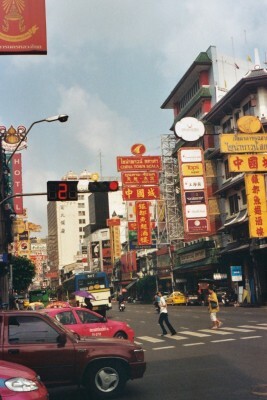 After nine days on the road, the food in our cooler was spoiling; my skin was dirty, mosquito-bitten and sunburned. A full moon rose over Boggsville. Wind blowing through cottonwood branches suggested the long-faded laughter of travelers who met in the village’s central plaza to swap goods and road stories. Two owls hooted back and forth, recalling a simpler, wilder time when people lived beyond the reach of mass communications, and camping was a way of life. We visited Bent’s Old Fort a few miles upriver from Boggsville the following day. Unlike military forts farther east, this fort’s purpose was for trading. The Bent brothers situated themselves at the juncture of Indian country, the Santa Fe Trail, and Mountain Man routes into the Rockies. They sold stores to the frontiersmen, acquired skins from the Arapaho, Cheyenne and Kiowa tribes, and traded for Mexican goods with the wagons from Santa Fe. Trade flourished at the fort for about 20 years beginning in 1833. During the Mexican War of 1846-48, it also functioned as a supply point and staging area for the U.S. Army running raids into New Mexico. Completely destroyed by fire, floods, and the sands of time, the fort was abandoned in 1853. The National Park Service excavated and reconstructed the building in the 1970s using historically accurate drawings and photographs. As we wandered past doorways of more than 20 adobe rooms on two levels, a historian dressed in period clothing fed a campfire by the fort’s door and answered questions about life on the frontier. The smell of burning juniper added to the authenticity of the restoration at this important outpost on the Santa Fe Trail. The trail turned sharply south past Bent’s Old Fort, leading across the Comanche Grasslands to Raton Pass on the Colorado-New Mexico border. At 7,400 feet, the pass represented the final major obstacle along the way to Santa Fe. Today railroad tracks and Interstate 25 both follow the original trail’s route across the conifer-dotted pass. Nearly 200 years later, it is still the only passage through this section of the Rocky Mountains. South of Raton, the trail closely followed the interstate all the way into Santa Fe. A die-hard history buff might continue along the interstate, visiting historical sites like Fort Union, an Army outpost, and Glorieta Pass, site of the westernmost battle of the Civil War. Otherwise, more interesting ways for a motorcyclist to reach Santa Fe include the scenic highway through Taos and the mountain route through Mora. Our own journey on the Santa Fe Trail ended where the Pecos River crossed the Interstate, as we detoured downstream to the delightful state park at Villanueva. By that time, immersed in the rich history and drama of the Santa Fe Trail, I could scarcely recall that my original objective had been to get to a rally in Kansas. The “boring” drive across the Great Plains had proven to be fascinating. Once again, the journey trumped the destination. In the most popular national parks, swarms of tourists can be as oppressive as the heat of summer. Many people’s memories of these places consist of fighting motor home traffic jams, jostling for souvenirs, and eating cheap hot dogs that have been on the warmer too long. On the shoulder season, however, crowds thin, parking spaces open up, and the animals emerge from hiding and show themselves. Now, gambling is legal in Montana, and I’m a gambling woman. When I moved here last winter, I naturally indulged in some video poker (Jacks Or Better is my game) in the mini-casinos that grace every intersection. I’ve also been known to bet on the ponies from time to time. So I decided to try my luck on the week after Labor Day to hit the National Park Trifecta: Glacier, Yellowstone, and Grand Teton. 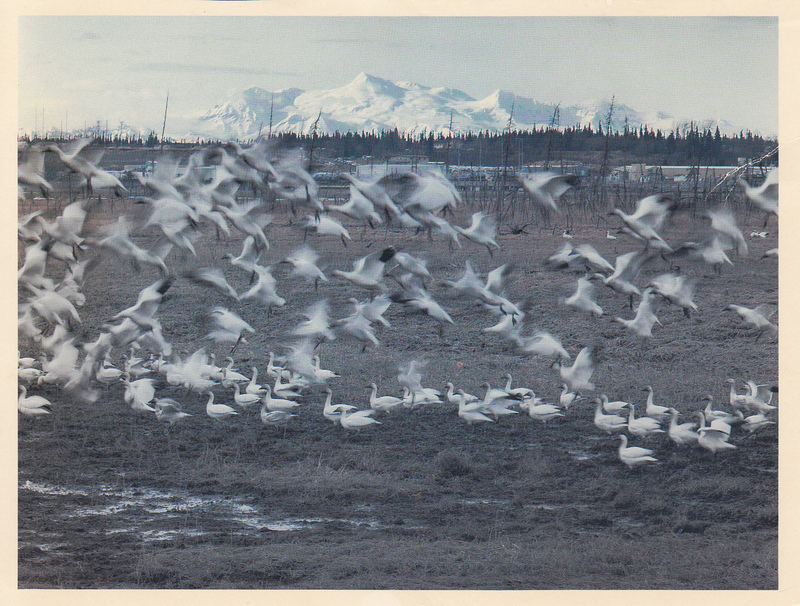 From Missoula, I first rode north alongside a three-of-a-kind of long, skinny lakes – Salmon, Seeley, and Swan. The mountains of Bob Marshall Wilderness, towering to the east, are locally known simply as “The Bob.” As in, “What happens on The Bob, stays on The Bob.” Shades of Las Vegas. I hasten to add that I haven’t any personal experience with what happens on The Bob. At least not yet. At Columbia Falls I turned east and headed for Glacier National Park. For a motorcyclist, the sure bet is Going-To-The-Sun Highway, which famously clings to the side of an impossibly steep mountain. An engineering marvel from the CCC era, the road easily lives up to its reputation for narrow and winding, with views to die for. I do not know the exact number of people who have taken their last breath sailing over the edge, but I would wager it’s a few. Traveling from west to east placed my motorcycle in the outside lane of the road. Near the road’s summit at Logan Pass, I glanced over the low wall along the road’s edge to my right. Empty air gaped, 2000 feet down. At that moment a sudden gust of wind hit me from the left. And, well, let’s just say that I “nearly” had to change my undies. Quite the thrill, quite the rush, the rider’s equivalent of being dealt a natural full house. Aces and eights, dead man’s hand. 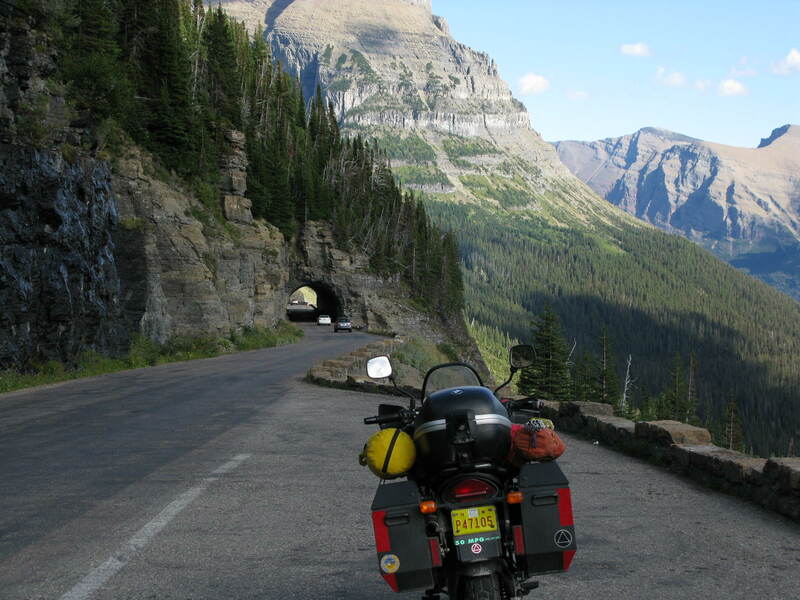 More motorcycles than cars crawled up the narrow strip of asphalt between Lake McDonald and Logan Pass. BMWs appeared to be the most common brand, though a healthy number of Harley-Davidsons were engaged in conquering the pass also. The people sealed inside of cars looked at us longingly. Anyone could see this road was a motorcyclist’s run for the roses. Camped at Rising Sun that evening on St. Mary Lake, I was busily slicing sausage onto crackers when I looked up to see a black bear less than 40 feet away. He was moving along the fringe of the campground. I like to see creatures in the wild, especially when they appear to have something better to do than paw through my food. This little guy ran right through and disappeared. My food was locked inside sturdy Jesse bags, but it still felt a little dicey to sleep in a nylon tent that night. Riding out the east side of Glacier the next morning, I leaned into a terrific side wind all the way down through the reservation. The Rocky Mountain Front rose abruptly from the golden plains of central Montana like a dream, like a mirage, like a neon-lit casino from the sands of the desert. Presently a distraction appeared southeast of my route: a smoke column appeared against the blue sky and built into a plume. Since I work in fire management for the U.S. Forest Service, the growing wildfire worried me. If it was anywhere near my forest, I’d have to cut my trip short. But as I got closer, I saw that it was on the Helena, not the Lolo. Still, in a year that was notoriously devoid of fires, it was the biggest column I’d seen all summer. I camped that night at a BLM campground called Red Rock, just a few miles west of Bozeman on a lovely twisting back road. Approaching Yellowstone from the north the next day, I threaded my way through the town of Gardiner. On my right sat the Two-Bit Saloon, looking a little worse for wear and tear after three decades. 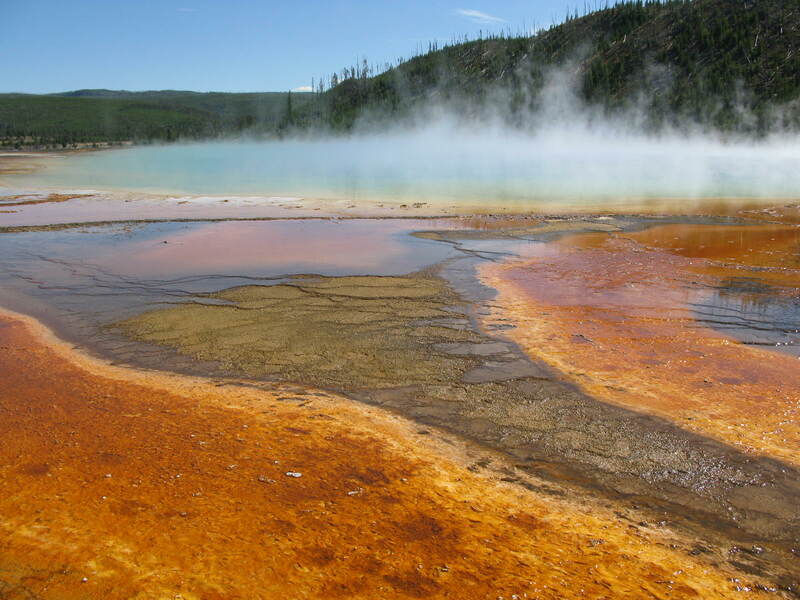 Back in the day, I was a college student having the time of my life working as a waitress in Mammoth Hot Springs. Life was carefree in those days, my only responsibility being to show up at work on time. The drinking age was 18, the Two-Bit Saloon stayed open late, and my friends and I were as wild as one-eyed Jacks. Ah, but Boiling River itself was still a world-class free hot spring, and my favorite in the whole world. 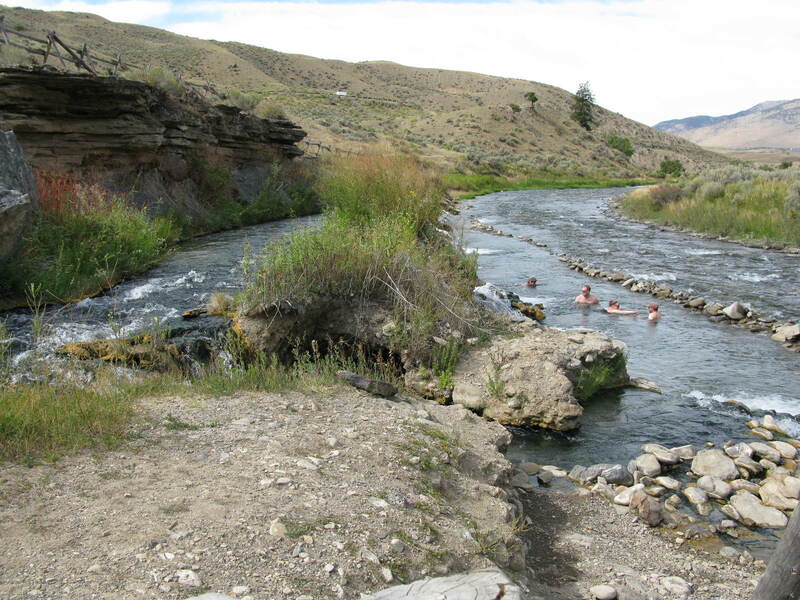 The hot creek fed by the Mammoth Terraces burst from the hillside and tore down to mix with the cold, clear water of the Gardner River. At their juncture, a motorcyclist tired from 300-plus miles ridden the day before could position herself underneath a thundering hot cascade and receive a straight flush of hot water to massage sore shoulders. The odor of sulfur was heady, seductive. The view downstream to sagebrush-and-juniper-clad hills was spectacular. Ignoring the handful of fellow tourists nearby, I leaned back against a rock, raised my face to warm sunlight, and soaked until my skin pruned. After my soak, I rode up to Mammoth Hot Springs Hotel, to find myself in the midst of a genuine elk jam. 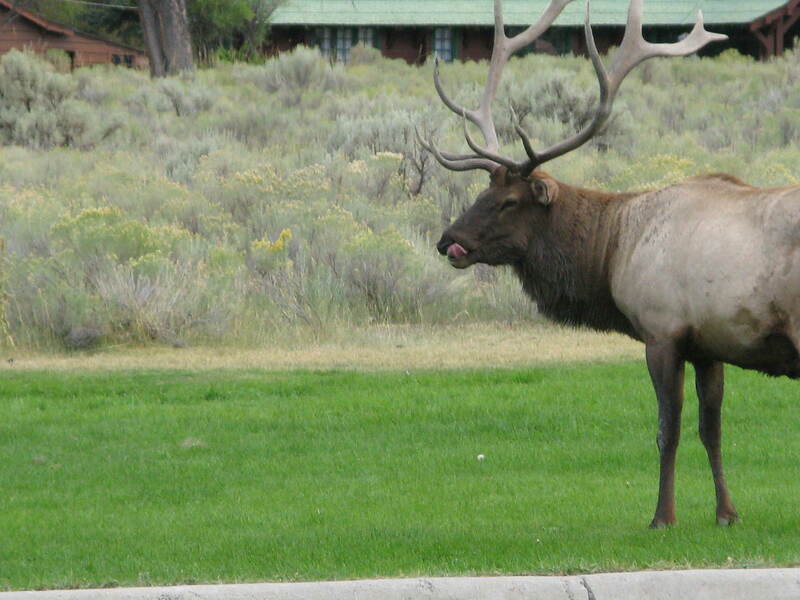 A huge bull elk, antler rack splendidly displayed, urged his harem of 20 cows across the hotel lawn. Park rangers used cones and megaphones to move people out of their way. I watched the show from the window of the restaurant where I used to work. The bull elk was larger than my motorcycle, and I figured it was even odds whether I could actually outrun it. Especially if it was protecting 20 girlfriends. Exiting the building at the rear, I cut behind the old boy’s dorm, rolled the dice, and made a successful dash for my bike. Temperatures dipped below freezing at Indian Creek, the campground where I stayed that night. In the morning I was thankful for the BMW’s heated handgrips as I made the ride on a gorgeous curving road past lakes and mountains to beat the tour busses to the Norris Geyser Basin. Norris is less visited than its sisters to the south, but is every bit as spectacular. With no company save the cheerfully erupting geysers, I followed a boardwalk out past the Ledge Geyser to reach some algae-laden streams colored the same bright green hue as a blackjack table. I passed a noisily bubbling pond aptly named Crackling Lake, and went the long way round to reach Little Whirligig, the cutest miniature geyser around. 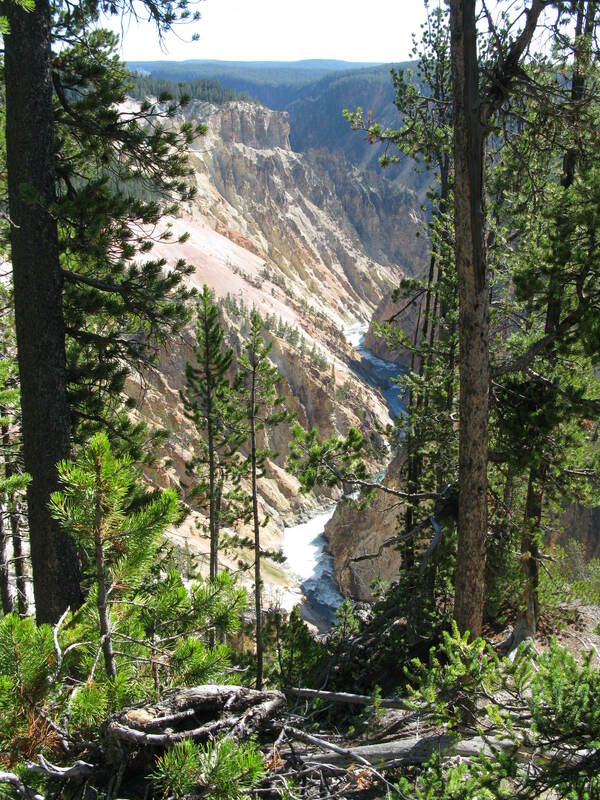 My next stop on the Yellowstone circuit was the obligatory gawk at the Grand Canyon of the Yellowstone River. I rode along a one-way road, parking my bike in a nearly-empty parking lot to walk to Grandview Point. The canyon always looks stunning, but slightly illusory. How could those colors be real? Restless, like a gambler on a losing streak, I felt an urgent need to move on. The lower geyser basins were calling and I could deny them no longer. Old Faithful was gushing as I rolled off the cloverleaf at most famous attraction in Yellowstone. But there are other geysers more faithful than Faithful, bigger, more frequent, so I didn’t bother to wait for it to go again. Instead I wolfed down an Old Faithful Inn chicken burger and headed north, betting on the come that I would catch an eruption of one of the less famous (and less crowded) geysers. Sure enough, I hit a modest jackpot when I pulled up to Great Fountain Geyser. 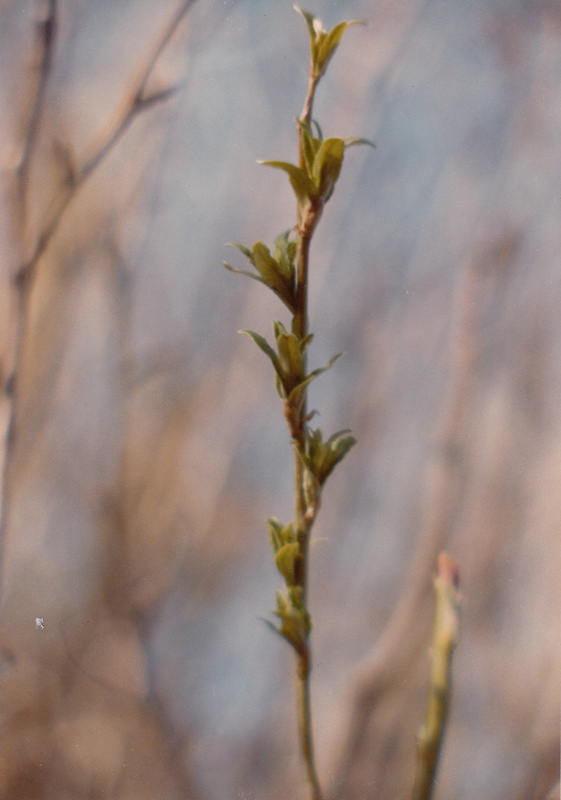 It agreeably sputtered, then shot into blue sky in a graceful plume three stories tall. I scored another win at Firehole Lake when I parked my bike in a lot absolutely empty of any other vehicles, and had the place to myself. And my third stop was a charm: I got to visit my best old friend, my favorite thermal feature in my favorite national park: the Grand Prismatic Spring. Kurt Cobain’s line in “Aneurysm” came into my head: “I love you so much it makes me sick.” As I breathed deeply of the sulfur, the steam, the brilliant rainbow colors, the delicate bright algae and bubbling water, I knew exactly what he meant. Suddenly I was transported back one year in time. The previous September, while I was preparing for a different motorcycle ride, a piano fell on me. An infection started, spread, slid into my bloodstream. 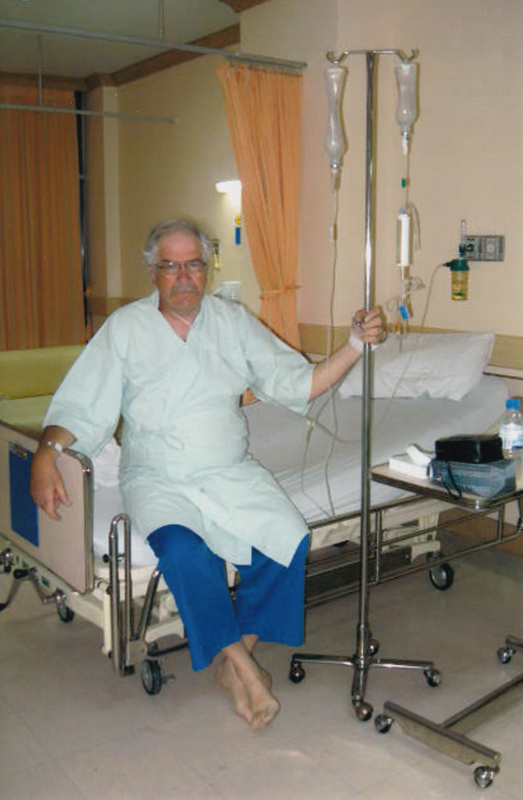 One day I was running my customary six miles and packing my saddlebags; the next day I was in the Intensive Care Unit, fighting for my life, as my organs failed and my systems shut down. I came closer than I’ve ever been to cashing in my chips and joining the Big Poker Game In The Sky. Floating for days on a hazy morphine cloud, barely hanging on, I lay in the hospital dreaming of this place – Grand Prismatic Spring. Now fully recovered from septic shock, I stood at the place which had sustained me through the darkness. My stomach wrenched remembering how near to the finish line I had drifted. There may have been a few tourists on the boardwalk but I didn’t see them through the tears of gratitude that filled my eyes. 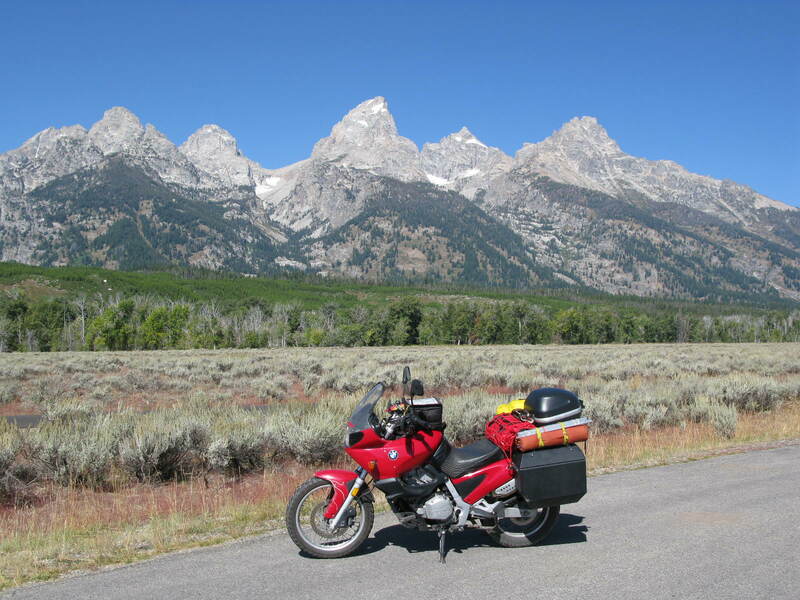 I waved at tons of motorcycles the next day as I wended my way south from my campsite at Lewis Lake into the little sister of Yellowstone, Grand Teton. It was a first class ride with yet another spectacular view around each curve. The paved road glided past the startling silhouette of sharp, craggy peaks which reminded the early explorers (who obviously had been away from the comforts of home for way too long) of breasts. In my opinion the Tetons looked more like wizard caps than women’s breasts. But you see what you want to see, and I’m sure the name appealed to those lonely guys – gamblers all – who had taken the chance of exploring the unknown instead of staying home where it was safe. An antelope jam gave me an excuse to stop along the park road. It was then that I noticed, snaking through sagebrush beneath the towering peaks, a beautiful, smooth asphalt bike path that paralleled the road for miles. So I promptly shed my riding gear, donned shorts and a jog-bra, and treated myself to an hour-long run beneath the magnificent peaks of the Teton Range. Buzzing on a runner’s high, I reviewed the whole thousand miles I had just ridden, through the National Park Trifecta. It was a blanket finish for the three most beautiful places in the Northern Rockies. But in the final stretch, it was perennial favorite Yellowstone on the nose to win; wild, beautiful Glacier to place; and iconic Grand Teton in the money to show. And I went home a winner. You have to respect anyone who has ridden more than a million miles on a motorcycle. At the same time, you assume that anyone who has accumulated that much “helmet time” would have some wisdom to share. But in the case of Mark “Tiger” Edmonds, that assumption would be wrong. Edmonds, the other of Longrider, a book of road stories, has penned a second book as an encore to his first. 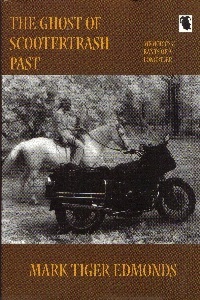 The subtitle of the new book is Memories and Rants of a Longrider. This subtitle serves as a warning: mostly what you will be getting is a bunch of disorganized babble by a man who is a legend in his own mind. You get the idea. Edmonds is a better poet than he is an essayist. For the most part, nothing happens in this book. It is stream-of-consciousness writing, complete with liberal use of hokey language and deliberately poor grammar. The author admits to holding a Ph.D. in English, so he obviously knows better than to use the double negative “ain’t no,” unless he is trying (too hard!) to sound folksy. In one paragraph he uses the phrase “damn near” three times. Beyond the affected style of writing, Edmonds could have really used some adjectives with teeth. About Highway 50 between Ely and Carson City, he says, “the whole of that portion is just as scenic as can be.” This description tells you nothing you didn’t already know. Every woman rider who appears in this book is a passenger on Edmonds’ bike. Apparently he has never met a woman who rides her own motorcycle. At least none that he is willing to write about. “I put her up behind me,” is his standard phrase in reference to women who ride with him. As a female motorcyclist who hasn’t been “put up behind” anyone in many years, I was rubbed the wrong way by this man’s chauvinistic attitude. A little bit of it goes a long way. Apparently other women feel the same way. “Once a girl has done heard all my stories and seen all my magic, well, I get pretty boring,” Edmonds writes. For me, this book was more than enough of Tiger Edmonds’ tedious self-obsessed prattle. For the reward of a few morsels of lryrical prose, plowing through this book was a chore. Take a road that loops around 80 miles of asphalt twisties in the Gila National Forest near Silver City. Blend it with some of the most spectacular mountain scenery in the southwest. Throw in a few Indian ruins, ghost towns, art galleries and outstanding home-cooked New Mexican food. The result? 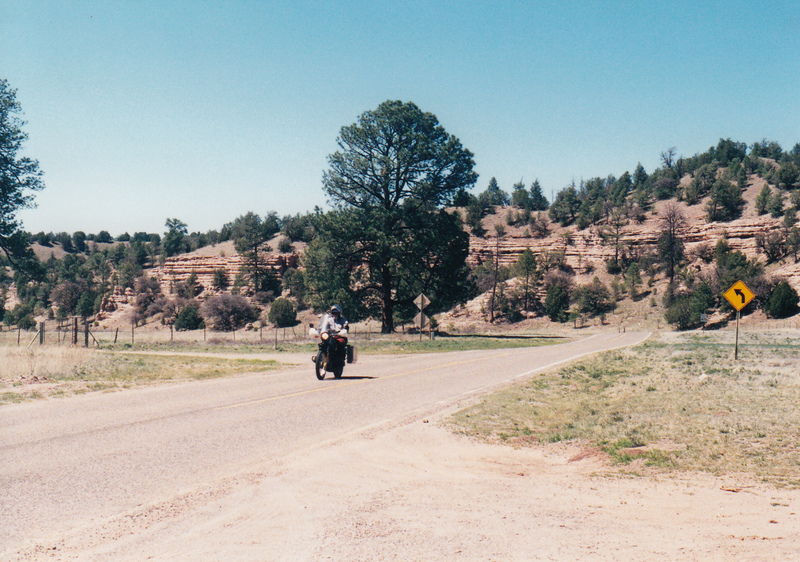 One serving of the best motorcycle ride in southwest New Mexico: the Gila Loop. Just getting to the loop is half the fun. From Caballo Lake, Highway 152 – the only paved route through the east side of the Gila Mountains – snakes past Hillsboro and Winston and up over Emory Pass. A scenic overlook near the top of the pass allows a non-vertigo-prone rider a panoramic view of the Rio Grande Valley, 4000 feet below. Beyond the pass, the road winds around hairpin curves and alongside cheerful little spring-fed creeks through the Gila National Forest. A word to the wise: beware of loose gravel strewn on the turns near Emory Pass. Once you reach the junction of highways 152 and 35, a decision looms. Counterclockwise leads directly up to the Gila Cliff Dwellings with only a few eateries along the way, while a clockwise move takes you to civilization first. I chose counterclockwise because out of the few places to eat on this route, Sister’s Restaurant in San Lorenzo has the best meals. However, your timing has to be just right, as it’s only open Wednesday through Sunday between 11 a.m. and 2:30 p.m. If your timing is off, there is always a good burrito to be had at the Mimbres Valley café. Order it banarse, bathed in red or green chile sauce, for a special New Mexican treat. The ride to the cliff dwellings passes scenic Lake Roberts, a summer magnet for boaters, fishermen, campers, and other hot-weather refugees. Just beyond the lake, turn right onto the Highway 15 spur road. Another 17 miles of colorful rock formations, voluptuous curves and spectacular vistas will bring you to the Gila Cliff Dwellings National Monument. 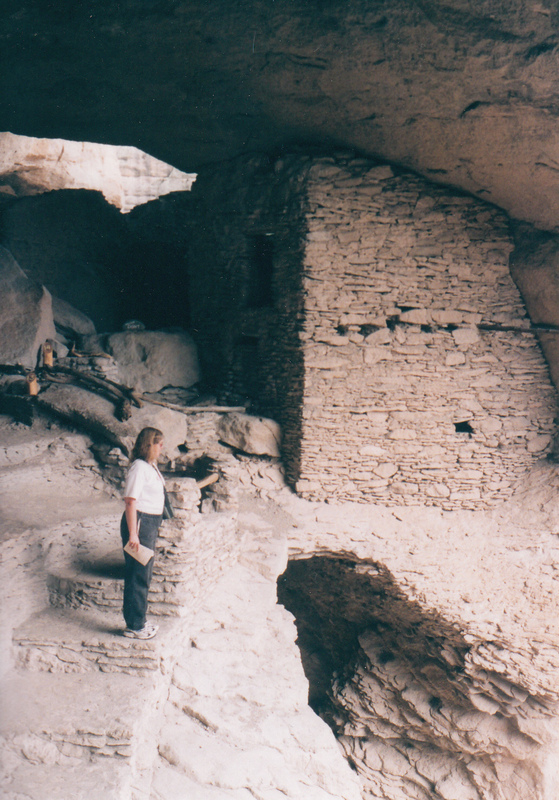 Stopping by the visitor center, you will learn that the Mogollon Indian cliff dwellings preserved within the monument are just one set among dozens of 13th-century structures located near this portion of the Gila River. A pleasant 30 minute walk up to the dwelling site follows a streambed lined with cottonwood and ponderosa pine trees. The $3 entry fee will buy you a comprehensive trail guide covering the history, culture, architecture and mysterious disappearance of the Mogollon people who once lived here. Backtracking to the junction of Highways 15 and 35, veer right to follow the Gila Loop toward Silver City. Along a 19-mile stretch from the junction to Pinos Altos, the road becomes almost impossibly narrow with no center stripe. The biggest hazard to be encountered will likely be an errant motor home in the wrong lane. Once a gold rush destination, Pinos Altos (“tall pines”) today consists of just a handful of art galleries as well as entertainment and food at the well-known Buckhorn Saloon. History buffs can take a short walking tour of such sites as an old cabin, a cemetery, and a 1971-vintage courthouse. From Pinos Altos the road emerges unceremoniously into Silver City, a bustling town that boasts “four gentle seasons.” Main Street, lined with an interesting collection of gift shops, restaurants, galleries and second-hand stores, backs up to the “Big Ditch.” Formerly the main street until it was washed out in 1905 by a flash flood, the chasm today is a city park complete with walking paths, picnic areas and two foot bridges, 55 feet below street level. A favorite place to eat in Silver City is the Adobe Springs Café on Silver Heights Boulevard, named for a natural spring still active beneath the 1937 building. The Southwest Breakfast, a pile of hash browns liberally laced with green chile and served with tortillas, is a treat at any time of day. Whether you consider it an ode to modern industriousness or an offensive blight on the landscape, the great hole in the earth left by the Santa Rita Mine is impossible to miss on the south side of the road heading east from Silver City toward the ride’s starting point. 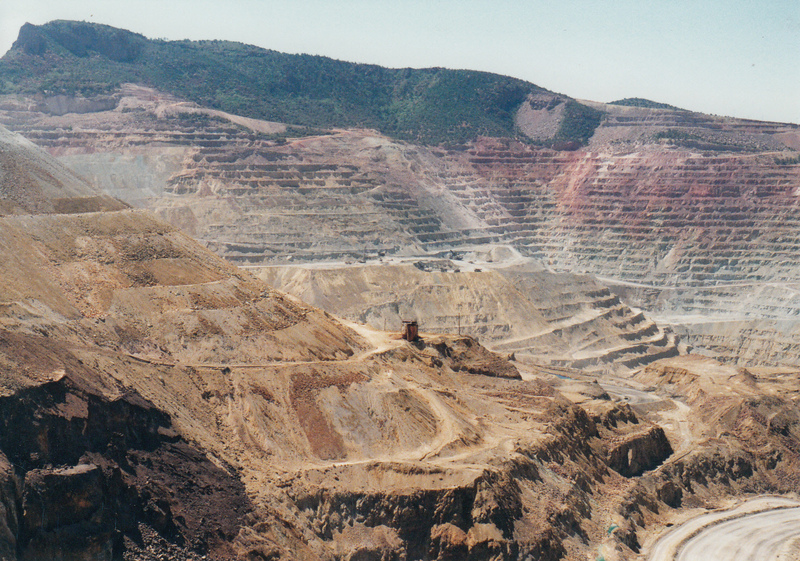 This copper mine, the oldest active mine in the Southwest, has been worked for more than 200 years. Radiating like warped spokes from the Gila Loop, intriguing twisty roads lead to local attractions such as the forlorn ghost town of Lake Valley (which features neither a lake nor a valley), the famous chiles of Hatch, the refreshing waters of Elephant Butte Reservoir, the quirky charms of Truth or Consequences, the haunting beauty of the City of Rocks and the engineering marvel of the Catwalk. 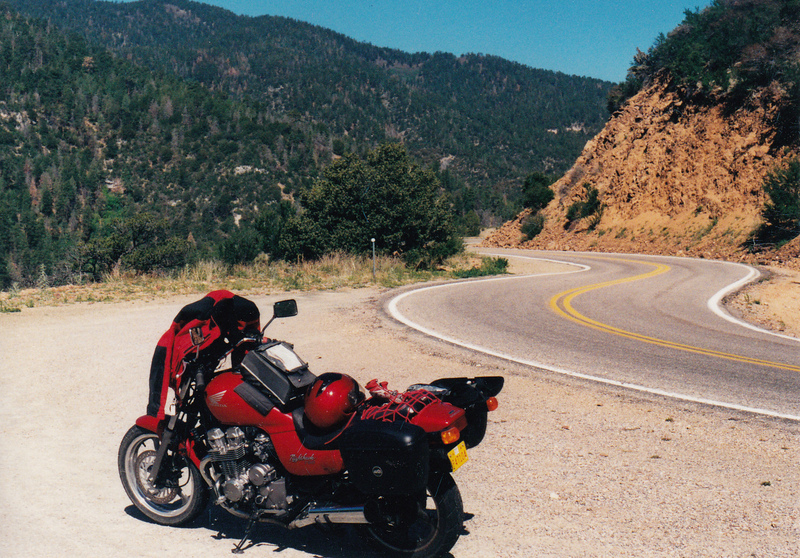 Yield to the temptation to linger; the winding roads of the Gila Loop region provide all the ingredients for a large helping of motorcycling satisfaction. When Brian and I chose December 1999 for our first foray into Mexico on four wheels, it never occurred to us to worry about the changing millennium. We were far more concerned with what camping conditions might be like in a foreign country. For a week we sat in Death Valley, getting our courage up. Finally we took a deep breath and rolled wheels into Mexico at the Tecate border crossing. As soon as we got across, we relaxed. 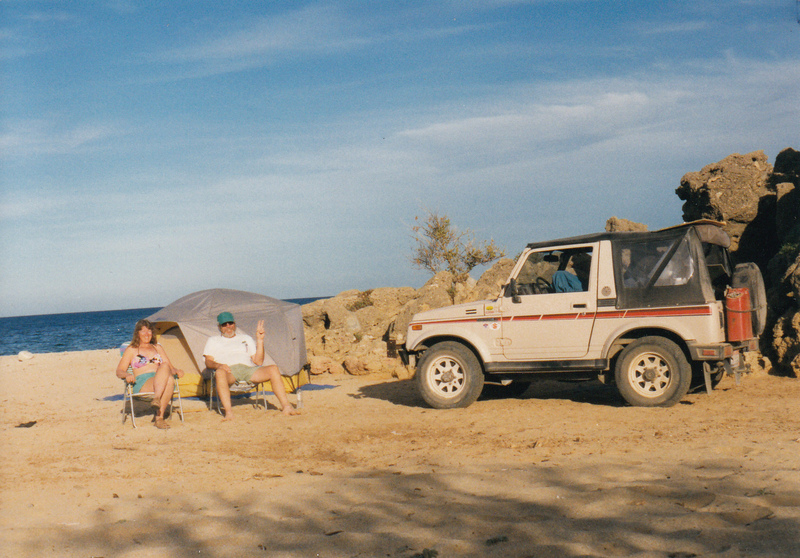 The Suzuki Samurai was a perfect vehicle for the Baja. The roads were mostly paved (if potholed) and the people were welcoming. Y2K fears of the pending millennium change had scared the majority of tourists away from foreign travel that year, so we found a lot of empty campsites. Just south of Mulegé, we settled into a palapa at Conceptión Bay. We met a few campers who planned to stay through the winter “on the beach,” but we wanted to keep exploring. After a few relaxing days there, we went inland, attended a Posada celebration for Christmas, paused in La Paz long enough to get really sick on some bad chicken, then departed for the cape in search of free camping. The first free camping space we christened “Perfect Beach.” We had neighbors half a mile away down the white sand; some sandstone rocks grouped in a shelter off the water to set up our chairs and a campfire; and a view of pelicans and magnificent frigate birds diving into the water out the front door of the tent. This beach we ranked a perfect 10, and the one against which all the subsequent campsites would be judged. A dirt road took off just south of the ritzy town of Los Barriles, heading in a roundabout way down to San Juan del Cabo. We went for miles and miles past private property and fields of corn and grazing cattle, all of it fenced off to vagabonds like ourselves. Finally we turned on a two-track and drove for several miles before stopping to camp in an open field that didn’t appear to be owned by anyone. We set up the tent and night fell. After dinner we started a tiny campfire and had just sat down when we heard heavy footsteps. Out of the darkness emerged a man shouting something in Spanish. Alarmed, Brian jumped up and tried to intercept the man. As soon as he got closer, it became obvious that he was an extremely intoxicated local. He held a machete in one hand and a bottle of tequila in the other. Yikes. Miguel spoke a little English and we spoke a little Spanish. For the next hour we labored to communicate with this plastered little campesino. He got across that he worked on the ranch there, but he had a cousin in California. He implored us to take him with us back to the USA. There were cattle ranging loose in the field where we were camped, and he kept repeating that they were “muy peligroso animals,” very dangerous! Over his head, Brian and I exchanged a glance. We need to get out of there immediately! Hastily, we folded up the tent and chairs and stuffed them in the back of the rig. Brian started up the engine. I jumped in the passenger seat. Miguel came right in after me and sat on my lap, reeking of tequila and tobacco. I gave him a shove out and slammed the car door. Brian hit the gas and we sped back down the two-track to the main road. Only now it was pitch dark. We continued further on the unfamiliar road until another turnoff appeared. Undiscriminating at that point, we turned in and drove back a ways onto some sand. There we set the tent back up and collapsed into weary sleep. The next morning was Christmas Eve. 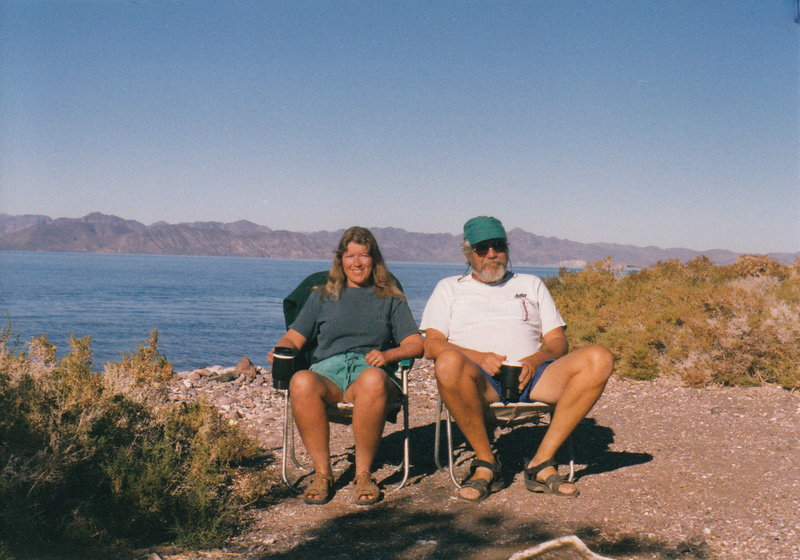 We looked around to discover that we were on an empty and pristine beach backed by sandstone cliffs, next to the Gulf of California. It was another perfect 10 of a campsite, made even sweeter by the fact that there were no drunk Miguels around to bother us. We pulled the rig back into an alcove between two sandstone cliffs, and set the parking brake. We’re the craziest vacas, that you could ever meet. Hey hey peligroso! Muy peligroso are we! We walk down to the tide line, and drink right out of the sea. After departing Christmas Beach, we hit civilization at San Jose del Cabo. There we heard about an upcoming New Year’s event, so we bypassed Cabo San Lucas and drove directly to Todos Santos to check it out. 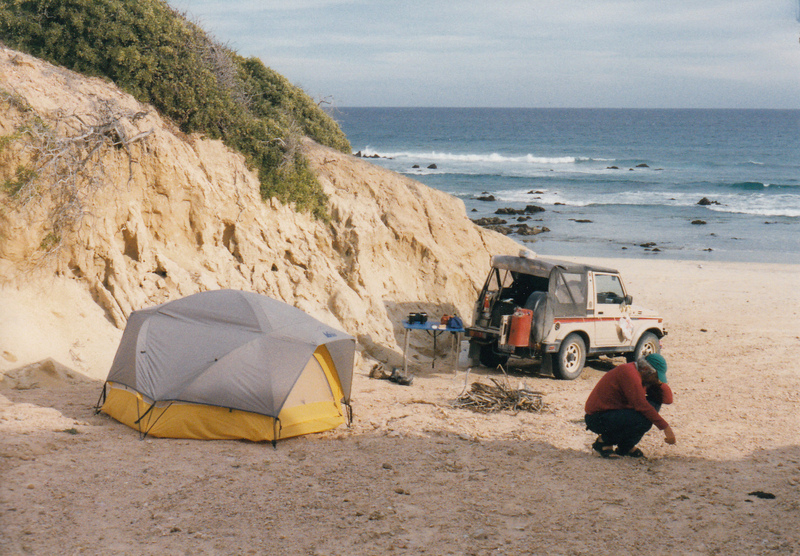 It turned out that the local expat community was planning a sober campout at the beach, so with two days remaining in the old millennium we set up camp next to a couple from Hawaii to wait for Y2K. People began arriving with food at sunset on New Year’s Eve. More and more salads, side dishes, and desserts showed up. Finally, someone backed a truck in and offloaded a whole roast pig. We ate until we hurt, laughing and talking with other travelers. When no one could eat another bite, we pulled the chairs into a circle. One by one, each of the 40 or so people present shared their experience, strength and hope. There wouldn’t have been enough booze in all of Mexico for us, if the group had decided to drink that night. But sober, we found much to be grateful for, in both the old millennium and the new. In this place, on the isolated coast of Baja, we felt safe from any conspiracy theory-based paranoia about the end of the world. After all, rural Mexicans still made change out of a cigar box. The Y2K bug was not going to be a problem here. Down on the beach, people set off fireworks as the old millennium slipped away under a waning moon. And the next morning, the new year dawned peaceful and serene. The end had become the beginning, and the day was full of promise. 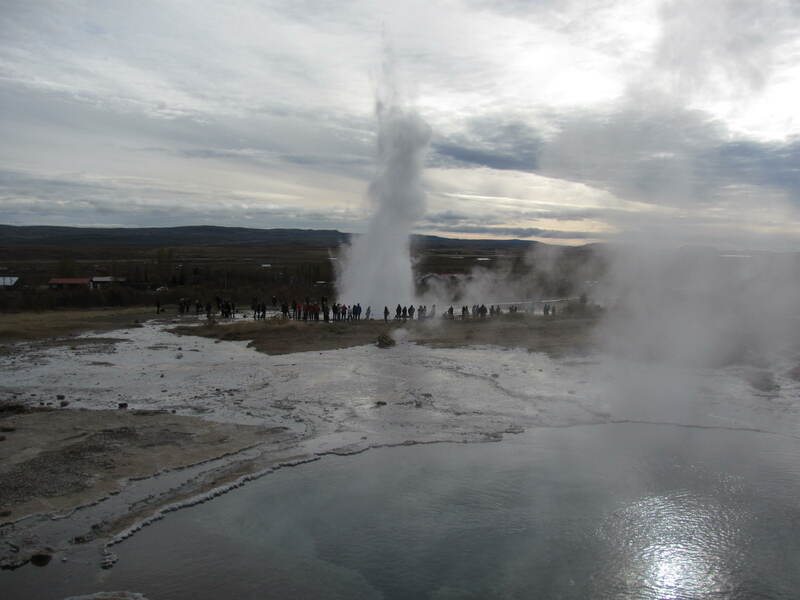 Iceland’s geysers, hot springs, and volcanoes always intrigued me. I planned to go in the summer of 1983, but life intervened. My car broke and I had to use the plane ticket money to buy a new car. The next year, I got a job in Alaska and moved up there to work for one summer. One summer turned into 14 years; I sobered up, got married, built a house, and launched a career. By the time I had the time and money to try for Iceland again, a total of 30 years had passed. This time, my husband wanted to take a trip to England, so I booked the flight on Icelandic Air so that I would be able to fulfill my lifelong desire to explore this mysterious frozen island in the North Atlantic. We stopped over in Iceland on the way home from England for three days. Staying in a hostel room in downtown Reykjavik, we walked on Laugavegur Street, enjoyed cheddar soup in bread bowls, and shopped at a mini-grocery around the corner. 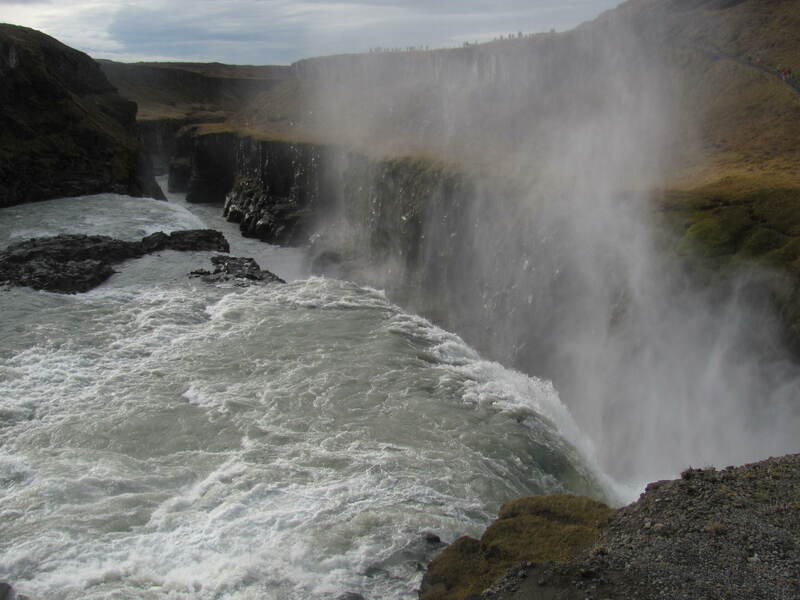 One day we took a full day trip to see Gullfoss Falls, Strokkur Geyser, and Thingvellir. We met some Icelandic ponies and walked through a lava tube. I was moved by the untamed natural beauty of the land. The next day, my husband wasn’t feeling well, so I left him at the hostel and ventured alone to the city bus station in search of an “authentic” Iceland experience. With the help of a friendly English-as-a-fourth-language ticket seller I secured a seat on a local bus that took me across town to Laugardalslaug, the best hot spring complex in Reykjavik. I wasn’t sure how to proceed. Once entering the locker room, I asked a teenage girl how the system worked. Of course she didn’t speak English, but she pantomimed for me where to leave my clothes in a locker, rinse in the shower, and go outside to soak in the hot pots. The outdoor temperature hovered near freezing, but the water was delightful. The largest of the six hot pools contained salt water, and it was there that most of the local people congregated. I lounged with my eyes closed, listening to them debate politics in the Icelandic language. It seemed like a friendly discussion. Even though I didn’t understand a word of it, they smiled and nodded at me while they talked, so I felt included. After two hours of soaking in various pools, my hands were thoroughly pruned and my body was relaxed. I made my way back to the bus stop in a cold wind. As I rode back to the hostel, night was falling and the lights of Reykjavik glittered in the twilight. My experiences in Iceland were magic, and I knew I’d return again someday.